You are here: Home / Agriculture / Braley says disaster victims now political pawns in D.C.
Braley says disaster victims now political pawns in D.C. 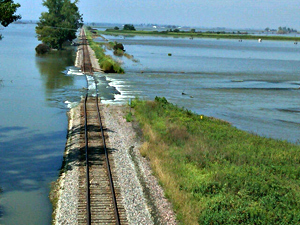 Congressman Braley's photo of flooding in western Iowa. Democratic Congressman Bruce Braley accuses Republicans of using disaster victims as “pawns” in the fight over the federal budget. Fifty Democrats and 10 Republicans in the U.S. Senate have passed a bill that provides the stop-gap spending for the nation’s disaster recovery programs, but the Republican-controlled U.S. House is poised to insist this week on making deep cuts in a program Democrats support to pay for that disaster relief. Congress has not passed a budget for the next federal fiscal year, which begins October 1. Braley said federal disaster aide for this summer’s flash-flooding in Dubuque and Jackson Counties as well as the Missouri River flooding is at stake, along with federal funds for disaster-related projects that date back to the flooding in Iowa back in 2008. Braley said while most Americans are well aware of the flooding which struck the east coast because of the recent hurricane, few realize Midwesterners who live and work along the Missouri River have been dealing with flood woes since June.